There are undoubtedly many benefits to building with lime. Buildings constructed with lime and traditional materials last a very long time, as thousands of buildings prove. Lime has been used in construction since the 4th Century BC; from Ancient Roman and Greek Empires to timber-framed cottages in the English countryside. Although lime buildings require regular maintenance there is no denying that these traditional materials age attractively as opposed to their modern counterparts which have a tendency to look shabby all too quickly. Evidence of damage caused to historic buildings by the use of cement mortars and modern plasters in repair has led to a revival of lime over the past 20 years both in conservation and new build. Lime is what is known as a binder. A better-known binder is Portland Cement - usually simply called "cement". A binder binds together the particles of an aggregate (loose, particulate material), for example sand to form a workable mixture. This mixture can be used to lay bricks (when it is called mortar), to spread on an external wall as well as a weatherproof layer (usually called a render) or on an internal wall (a plaster). Using different aggregates, types of lime and other ingredients will give mixtures with specific characteristics that make them suited to particular mortars, renders or plasters. Portland cement makes possible the creation of spectacular modern buildings and civil engineering structures. However, it is the properties that make it so suitable for such projects, namely its strength, hardness and impermeability, which also make it quite unsuitable for the repair of buildings not originally constructed with it. Indeed the use of cement in the repair of such buildings can cause alarming rapid decay. Cement has only been manufactured since around 1824 and was not widely used until the 20th century. Until then, buildings were constructed with lime. 40% of existing UK housing stock was not built with cement! Lime has been used as a binder for over 7,000 years. From the Greek and Roman Empires to the ancient civilisations of Asia and Central America, from the Great Wall of China to the great cathedrals of Europe, the continuing survival of buildings and structures many hundreds of years old demonstrates the suitability of lime as a binder for mortars. Caesar’s Tower at Warwick Castle has stood the test of time for over 600 years, and many cathedrals have endured longer. An outstanding example is the Pantheon Temple in Rome, which has a lime concrete dome spanning over 43 metres (142 feet). This has stood for nearly 2000 years. More flexible, thus allowing thermal expansion or other movement in a structure. For example, brickwork built with lime mortar can usually be built in a continuous run; it does not need the unsightly vertical expansion joint every 10 metres that is necessary with cement mortars. Softer, thus providing a sacrificial element to protect brickwork from frost. Lime mortar in brickwork is softer and more permeable than brick. When the brickwork gets wet, moisture is absorbed from the bricks by the mortar through which it escapes. Any frost damage, caused by expansion of moisture, is thus confined to the mortar joints - which is why brickwork occasionally needs repointing. If the brickwork is repointed in cement mortar, which is hard and virtually impervious, moisture can only escape through the bricks, the surface of which can spall (break up) if exposed to frost, permanently damaging the wall. Vapour permeable, thus allowing moisture in a building to escape. Before the days of cavity walls, moisture inside a building and in its structure escaped up chimneys, around doors and windows and through the walls, Replacing lime renders with cement-based ones and lime plasters with gypsum can cause damp to be retained in walls. The results can be anything from minor damp patches to serious structural damage. Protective to adjacent materials such as timber, iron, stone brick and existing masonry. Unlike strong cement-based mortar based mixes, lime mortars are porous and permeable which allows them to handle the moisture movements through the building fabric and protect adjacent materials. Have good workability. Lime mixes are a pleasure to work with as they stay smooth and malleable, even against the suction it may experience from porous building materials. The workability of lime means that a variety of graded aggregates can be added to the mix to enhance the performance and aesthetic. in large cracks. Buildings made with lime react to movement by developing many fine cracks. Water then penetrates these cracks and dissolves any ‘free’ lime it encounters. As the water evaporates this lime is deposited and begins to ‘heal’ the cracks. Healthy: Due to its caustic nature lime has long been recognised as having disinfectant qualities – usually in the form of limewash but also in mortars, plasters and renders. This quality means it will resist the build up of mould and improve the comfort conditions of buildings. Environmentally friendly: the production of lime undeniably requires far less energy than that required for cement production. Lime, therefore gives off less CO2 during manufacturing and unlike cement, re-absorbs a high percentage of that CO2 when curing. Lime is derived from limestone. 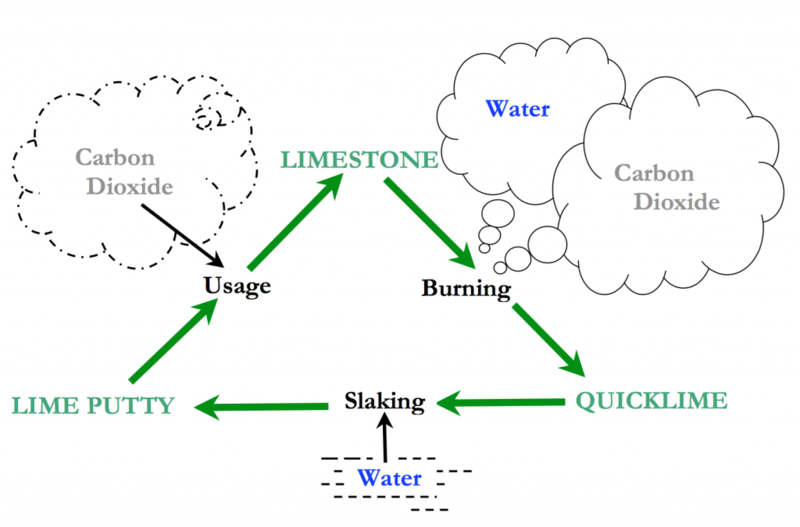 By a process of neat simplicity, known as the lime cycle, it reverts to limestone again when it is incorporated into a building. 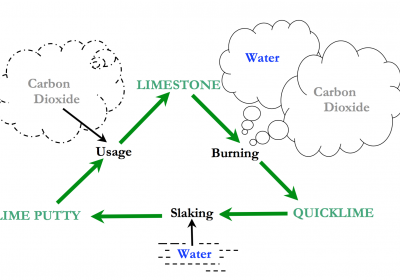 Limestone (calcium carbonate), is burnt in a kiln. This drives off water and carbon dioxide leaving quicklime (calcium oxide). The quicklime is mixed with water, a process called slaking a violent reaction produces lime putty (calcium hydroxide). The lime putty in the mix, once exposed to the air, combines with carbon dioxide to form limestone again. Lime Putty is produced as described in the Lime Cycle. The consistency of soft butter, it should be at least 3 months old before it is used - it continues to improve the older it becomes, hence it is often described as "matured" lime putty. It cures simply by exposure to air, combining with carbon dioxide - which is why it is also known as "air lime". This process of combining with carbon dioxide is known as carbonation. More information regarding our Lime Putty can be found on our products page. Certain types of limestone contain inclusions of silica. When such limestone is burnt, these naturally occurring "impurities" convert to compounds that cause the lime to set when added to water. Such lime cannot therefore be slaked to produce a lime putty, as it would simply solidify. It is therefore slaked by spraying with a precisely metered quantity of boiling water, just sufficient to change it from quicklime (calcium oxide) to calcium hydroxide. The heat produced by the exothermic reaction that this causes is sufficient to leave the resultant lime as a dry powder, known as Natural Hydraulic Lime. Natural Hydraulic Lime, mixed with sand and water to make a mortar, sets initially by reacting with the water (the hydraulic set) and then goes on to carbonate (combine with carbon dioxide) in the same way as a mortar made from lime putty. More information regarding our Natural Hydraulic Lime can be found on our products page. All lime mortars require the use of clean, well-graded sharp aggregates (sands). In this context, sharp means rough and irregular-shaped particles, and well-graded means that if you put a sample through a set of grading sieves, a proportion of the sand will be left in each mesh size. Thus the mortar comprises particles with gaps between them partially filled by slightly smaller particles, the gaps between those partially filled by smaller particles still, and so on. All the particles are coated with lime, which binds them all together to form the mortar. It is this interlocking jigsaw-puzzle effect that gives the mortar its structure and is the most important factor in determining its ultimate strength. Cement mortars are often made with so-called "soft" sands. These are comprised of rounded or semi-rounded, often monogranular (same-sized) particles. In contrast to the support given to masonry by the interlocking effect of a well-graded, sharp sand, this is like trying to balance the masonry on layers of ball-bearings. Such mortars rely on the inherent strength of the binder - cement in this case - to hold them together. Mechanically this is a less satisfactory system, requiring much harder mortar. Apart from contravening the basic principles that the mortar should always be softer than the masonry it is bedding, the impervious nature of cement mortars can result in damage to the masonry by preventing the migration of moisture to mortar joints from which it is supposed to evaporate. The inflexible nature of cement mortars also requires the use of expansion joints in new brickwork, an eyesore unnecessary with lime mortars, which allow movement. There is often a confusion of a nomenclature about aggregates. Technically, sharp and soft sands are as described above. The finer gradings of a sharp sand, such as would be used for plastering coats, are technically still sharp but are often called soft sand, because they do not contain visibly separate pieces of grit. They are also often referred to as plastering sands. By analysing an existing mortar, matching aggregate and finishing the joint to make it look weathered, it is possible to repoint brickwork and to make the repair indistinguishable from the original. This is particularly important where patch repairs are done in an area of otherwise sound masonry. Mortar analysis can also be necessary where the mortar of new brickwork needs to harmonise with some adjacent masonry. We can carry out mortar analysis for you. Simply send us some lumps of the mortar. We will need the equivalent of a half-pint mug full of lumps that are at least sugar-cube sized. It is important that the mortar is carefully removed in lumps from the brickwork joints; if the mortar is simply scraped out, the sample will not give an accurate enough representation of the aggregate. Once we have analysed your mortar sample we can suggest a DryReadymix Mortar to match your specifications using the recommended hydraulic lime, aggregate and binder. Why use Hair / Fibre in a Mix? In restoring timber-framed buildings, a mix of one part lime and 3 parts sand, with the addition of animal hair, is often specified for plaster and renderwork on wooden laths. This can give very satisfactory results - as long as the plasterer is actually aware of how much hair there should be in the mix. However, such a mix will give a plaster that is the consistency of biscuit, whereas the original is often clearly different and much more flexible material, much softer and paler in colour. Twenty years ago, we examined the plasters of various recently repaired ceilings that had suddenly collapsed without warning. In each case the plaster was a brittle, lime and sand mix containing hardly any hair, bearing no resemblance to the original plasters that are widespread in so many old buildings and are still in excellent condition after several hundred years. Analysis of many old plasters showed them to contain no sand at all. They comprised lime, chalk and a great deal of hair - up to 16kg per cu metre, much more than we were aware of anybody using. Since then we have been replicating those old plasters with our Haired Chalk Mix and, more recently our FibreChalk Mix. There are now many examples of its very satisfactory use, on both interiors and exteriors. As well as being soft and extremely flexible, well able to accommodate considerable movement, even on recently repaired timber frames, it is also much lighter in weight than the equivalent lime and sand mix. This considerably reduces the load hanging on the building and makes it a perfect material for ceilings. Our Haired Chalk Mix and FibreChalk Mix contain 12kg of goat hair / fibre per cubic metre. The benefit of fibre over animal hair is that fibre is not susceptible to degradation in the wet plaster mix. While there is an element of adhesion of render / plaster to laths, it is the all-important bit of render or plaster between the laths that is essential to it all remaining in place. This "neck" connects the nib - the lump of render that forms on the back of the laths - with the render face, anchoring the render to the lath. Hence the importance of adequate hair in the mix, as without such reinforcement, the tensile strength of this "neck" is minimal. (Adequate hair also gives the plaster flexibility to accommodate any movement in the substrate). Equally essential are sufficiently wide spaces - 10mm to 12mm - between the laths to enable render to be pushed between them to form this anchor. A simple gauge when fixing laths is the thickness of the tip of ones little finger. The two principle causes of failure of plaster and render applied to wooden laths are insufficient hair in the mix and insufficient gaps between the laths. We are often surprised that while the other ingredients of a mix are specified in careful proportion, the hair content is frequently only referred to in the vaguest terms, with the specifier clearly relying on the plasterer to judge for himself. All too often the inadequacy of such "specifications" is later exposed, together with bare laths, by a sudden and unexpected collapse of plaster. Our Haired Chalk Mix and FibreChalk Mix contain the perfect amount of hair/fibre to ensure the correct tensile strength for adhesion to laths and other substrates. More information regarding our wooden laths can be found on our products page.